Thank you for visiting our world of deerskin leather handbags and accessories.. What began in 1995 as somewhat of a retirement enjoyment has developed into a healthy international company with loyal customers from around the globe. We like to feel this is because from the beginning our total concern was to make a product that was high in quality, could be purchased at a reasonable price and with proper care would last for many years. So now, as in the beginning, each piece is carefully handcrafted to the highest quality standards and affordably priced for discerning customers who want a distinctive southwestern style. To insure the highest quality standards are met all of our products are 100% handmade. Stitched together with deerskin lace. This makes for a more durable product that will last for years with proper care. This also makes the inside dimensions slightly larger and easier to keep clean. We use only number one grade USA deerskin leather in our products. When available we also use number one grade New Zealand deerskin. The world’s best deerskin. 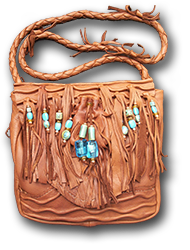 We include natural deerskin leather “marks of distinction” and natural edges enhanced with just the right touch of fringe, beads of real stones, and feathered or sculpted leather making each piece truly one of a kind. Please do not hesitate to contact us with any questions, comments or concerns you may have. Our goal is to focus our energy on happy customers who will return again and again to enjoy and share the fine quality products we can usually create especially for them.